Monday September 11th 1893 Will washed for me in the morning. I cleaned up things some and ironed a few things before dinner. I ironed more in the afternoon, swept Mr Edwards rooms and got rooms ready for Mr Fuller down stairs. Will went to the valley in the afternoon. I had a hard days work. 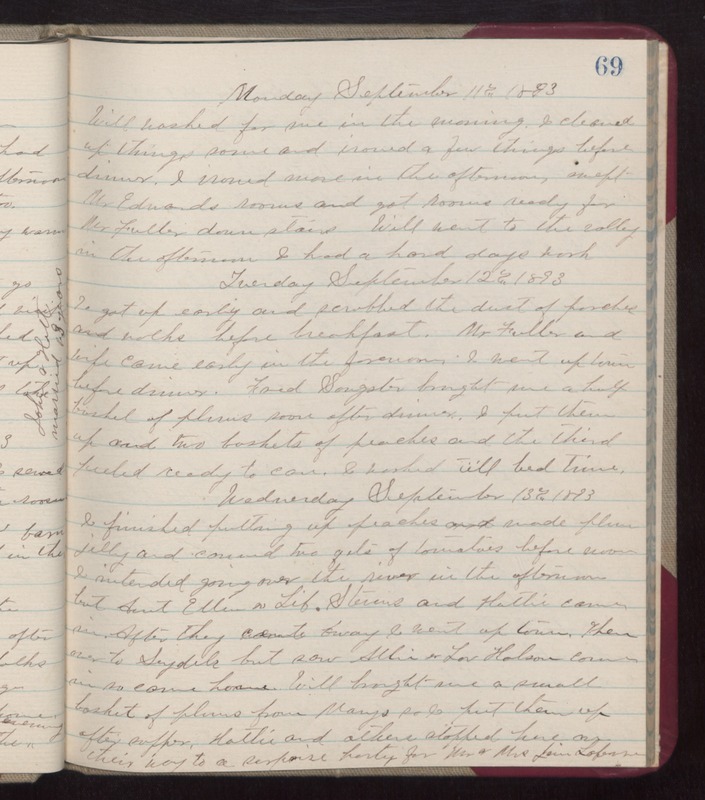 Tuesday September 12th 1893 I got up early and scrubbed the dust of porches and walks before breakfast. Mt Fuller and wife came early in the forenoon. I went up town before dinner. Fred Sougster brought me a half bushel of plums soon after dinner. I put them up and two baskets of peaches and the third peeled ready to can. I worked till bed time. Wednesday September 13th 1893 I finished putting up peaches and made plum jelly and canned two qts of tomatoes before noon. I intended going over the river in the afternoon but Aunt Ellen & Lib Stevens and Hattie came on. After they went away I went up town. Then over to Seydels but saw Allie & Lou Halson come in so came home. Will brought me a small basket of plums from Mays so I put them up after supper. Hattie and others stopped here on their way to a surprise party for Mr & Mrs Jon Lafevre.